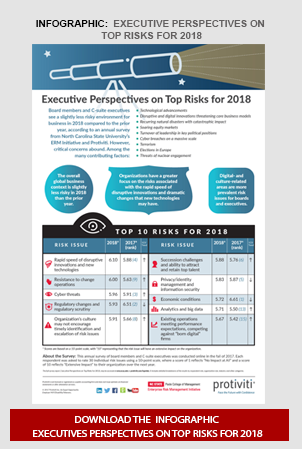 Board members and executives are concerned about the rapid pace of technological developments and disruptive innovation as they head into 2018, according to the results of the sixth annual Executive Perspectives on Top Risks for 2018, conducted by NC State’s Enterprise Risk Management (ERM) Initiative in partnership with Protiviti. Released today, the survey report assesses the concerns of 728 board members and executives globally. Concerns about disruptive innovation significantly outpace fears of economic uncertainty and regulatory scrutiny, which have consistently been the top risk issues of board members and executives over the past several years. Additionally, respondents also indicate concerns that organizational resistance to change may restrict their ability to make the necessary adjustments to the business model and core operations. It is particularly interesting to observe an increasing concern among survey respondents that their organization’s culture may not sufficiently encourage the timely identification and escalation of risk issues to senior management and the board. As boards of directors and senior executives seek to improve their understanding of emerging risk issues, they may need to re-evaluate how their organization’s culture might be impacting the robustness and transparency of their risk identification and risk reporting efforts. This just released report, Executive Perspectives on Top Risks for 2018, summarizes the top risks that executives and board members see on the horizon for 2018 and it provides an analysis of top risk concerns across a number of industries and sizes of organizations, and executive positions. The report is a reminder of the need to devote more resources to risk management and risk oversight given the complexities and risks within the global business environment. 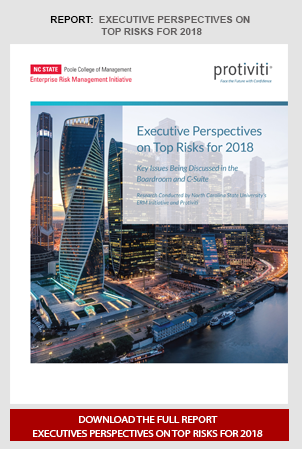 More importantly, the report documents a number of differing viewpoints between boards and executives about risks on the horizon, which emphasizes the need for robust and ongoing dialogue among an organization’s top leadership. Register for the Executive Perspectives on Top Risks for 2018 report findings webinar. On Thursday, December 14, 2017 at 1:00 PM Eastern time, we will discuss the report findings in an interactive live webinar. Topics will include: Overall survey results; Top 10 risks and key observations by industry, company size and respondent role; Implications for organizations; and Suggestions on how to respond to these top risks. The webinar will feature North Carolina State University’s Professor Mark Beasley and Protiviti’s Executive Vice President, Pat Scott, and Protiviti’s Managing Director, Jim DeLoach. You may register for this free webinar here.